Gentrification: Not Ousting the Poor? 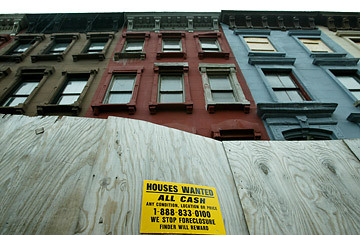 A sign advertising for "Houses Wanted" stands on a temporary wall in front of row houses in the Harlem neighborhood of New York City. People tend to think gentrification goes like this: rich, educated white people move into a low-income minority neighborhood and drive out its original residents, who can no longer afford to live there. As it turns out, that's not typically true. A new study by researchers at the University of Colorado at Boulder, University of Pittsburgh and Duke University, examined Census data from more than 15,000 neighborhoods across the U.S. in 1990 and 2000, and found that low-income non-white households did not disproportionately leave gentrifying areas. In fact, researchers found that at least one group of residents, high schooleducated blacks, were actually more likely to remain in gentrifying neighborhoods than in similar neighborhoods that didn't gentrify  even increasing as a fraction of the neighborhood population, and seeing larger-than-expected gains in income. Those findings may seem counterintuitive, given that the term "gentrification," particularly in cities like New York and San Francisco, has become synonymous with soaring rents, wealthier neighbors and the dislocation of low-income residents. But overall, the new study suggests, the popular notion of the yuppie invasion is exaggerated. "We're not saying there aren't communities where displacement isn't happening," says Randall Walsh, an associate professor of economics at the University of Pittsburgh and one of the study's authors. "But in general, across all neighborhoods in the urbanized parts of the U.S., it looks like gentrification is a pretty good thing." The researchers found, for example, that income gains in gentrifying neighborhoods  usually defined as low-income urban areas that undergo rises in income and housing prices  were more widely dispersed than one might expect. Though college-educated whites accounted for 20% of the total income gain in gentrifying neighborhoods, black householders with high school degrees contributed even more: 33% of the neighborhood's total rise. In other words, a broad demographic of people in the neighborhood benefited financially. According to the study's findings, only one group  black residents who never finished high school  saw their income grow at a slower rate than predicted. But the study also suggests that these residents weren't moving out of their neighborhoods at a disproportionately higher rate than from similar neighborhoods that didn't gentrify. This study isn't the first to come to that conclusion. A 2005 paper published in Urban Affairs Review by Lance Freeman, an assistant professor of urban planning at Columbia University, looked at a nationwide sample of neighborhoods between 1986 and 1989 and found that low-income residents tended to move out of gentrifying areas at essentially the same frequency they left other neighborhoods. The real force behind the changing face of a gentrifying community, Freeman concluded, isn't displacement but succession. When people move away as part of normal neighborhood turnover, the people who move in are generally more affluent. Community advocates may argue that succession is just another form of exclusion  if low-income people can't afford to move in  but, still, it doesn't exactly fit the popular perception of individuals being forced from their homes. The new study found that while gentrification did not necessarily push out original residents, it did create neighborhoods that middle-class minorities moved to. The addition of white college graduates, especially those under 40 without children, was a hallmark of gentrifying neighborhoods  that much fit the conventional wisdom  but so was the influx of college-educated blacks and Hispanics, who moved to gentrifying neighborhoods more often than they to did similar, more static areas. Two other groups tended to move more often into upwardly mobile neighborhoods as well: 40-to-60-year-old Hispanics without a high-school degree, and similarly uneducated Hispanics aged 20 to 40 with children  a counterpoint to the common conception of gentrification, if there ever was one. The only group that was less likely to move to a gentrifying area was high schooleducated whites aged 20 to 40 with kids. The study is under review for publication, but is being circulated early by the National Bureau of Economic Research. The findings, while unexpected, are notable for the depth of data on which they're based. Walsh and his colleagues, Terra McKinnish, an associate professor of economics at the University of Colorado at Boulder, and Kirk White, an economist at Duke University's Triangle Census Research Data Center, compared confidential Census figures from 1990 and 2000 from 15,040 neighborhoods, with an average of about 4,000 residents each, in 64 metropolitan areas, such as Phoenix, Boston, Ft. Lauderdale, Columbus, New York, Atlanta and San Diego. The researchers identified gentrifying neighborhoods as those in which the average family earned less than $30,079 in 1990  the poorest one-fifth of the country  and at least $10,000 more 10 years later. Taken all together, the study paints a more nuanced picture of gentrification than exists in the popular imagination. But the authors acknowledge that it leaves plenty of unanswered questions, such as why certain demographic groups are more likely to stay in  or move to  gentrifying neighborhoods, and why certain groups, such as blacks without high school degrees, don't see the same income gains as others. Then there is that most fundamental of questions: does gentrification lead to greater wealth for people in a neighborhood, or are the people who choose to live in such a place otherwise predisposed to make more money? "This study shows us a lot more about gentrification," says Walsh, "but there's still a lot we don't know."